North Korea marked its 61st anniversary Wednesday with the country's main newspaper in Pyongyang issuing a lengthy editorial pledging to defeat any U.S. aggression. If case of a U.S. attack, the North would "mobilize all military strengths and mercilessly annihilate the aggressors," the Rodong Sinmun editorial said. The declaration comes amid increasing international pressure on North Korea following its abandonment of a 2007 disarmament-for-aid package and its pullout from talks with the U.S., South Korea, China, Russia and Japan. Further adding to tensions, North Korea conducted a nuclear test, launching a rocket and test-firing a barrage of missiles earlier this year. However, it has recently reached out to Washington and Seoul by releasing detained Americans and South Koreans and reportedly inviting U.S. officials to Pyongyang for one-on-one talks. The paper also praised leader Kim Jong-il's "military first" policy, under which he has devoted much of the impoverished country's scarce resources to his 1.2 million-member army, making it one of the world's largest. 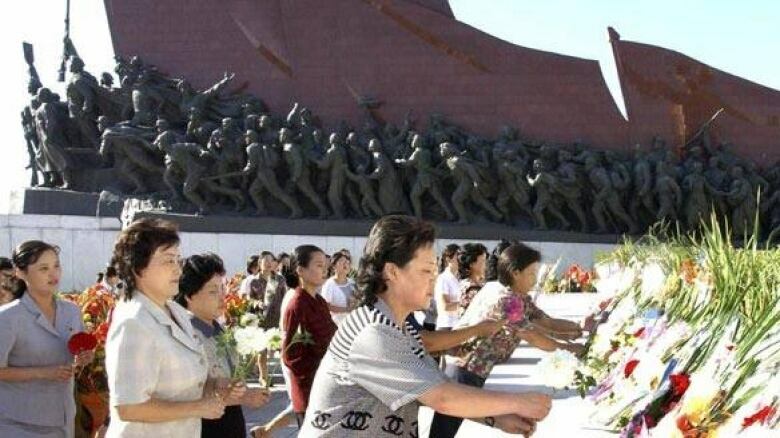 In a show of patriotism, North Koreans streamed to Mansu Hill in Pyongyang on Wednesday to lay flowers and bow before a towering statue of the country's late founder, Kim il-Sung.